When the United States withdrew from the Paris climate agreement, it sparked a debate over what should happen next. 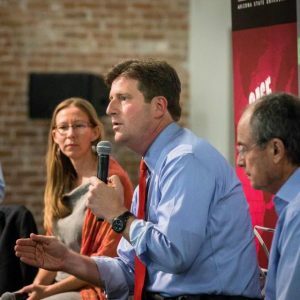 That debate was reflected during a June 2017 Case Critical discussion, held by the ASU Wrigley Institute and featuring Phoenix Mayor Greg Stanton, School of Sustainability Assistant Professor Sonja Klinsky and ASU economist William Boyes. The discussion was moderated by Rob Melnick, executive director of the institute and a professor of practice in the School of Sustainability. Kinsky reiterated the views she shared in a recent ASU Now interview, adding this about the way forward: "I think we’re swimming with opportunities. There are large-scale technological investments. The cost of air pollution to people’s health is astronomical. That’s a public health debate. There’s a social justice perspective. How will we deal with agriculture? Find your skill set and apply it."